by Ben Byrne, June 2014. Mediumistic: experiential sound and sculpture walk calls attention to the Abbotsford Convent itself, asking participants to explore its many hallways and anterooms and rewarding those possessing a keen eye with a chance to hear some of the place’s many voices. According to the work’s website, it asks participants to sense the space through a self-led ‘experiential sound and sculpture walk’, described as a ‘psychic archaeology’. 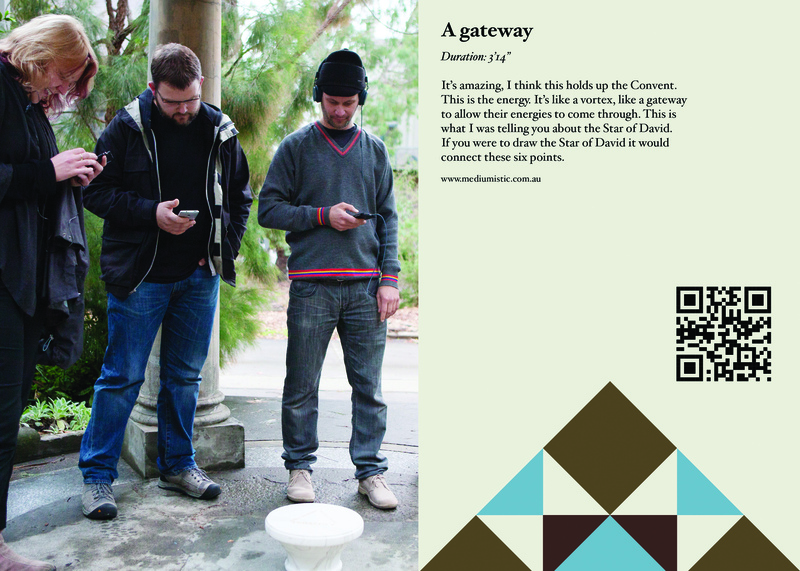 Given a ‘Gateway’ from which to begin, participants are asked to explore the spaces of the convent on their own. Kasia Lynch, the artist behind Mediumistic, has staged subtle but marked changes to the convent. A tile out of place here, something that doesn’t belong there. This interference leads to Jordan Lacey’s soundings of the convent and the voices that echo from its walls. QR codes displayed on plaques near each of Lynch’s works link to his audio, which can be listened to with a smartphone and data connection. I had an affecting experience on the Grand Stairs of the Main Convent Building. As I walked up the stairs I felt a sensation of someone walking close beside me, almost brushing against my shoulder. Three or four times I stopped and turned to see who was there, and each time there was no one I could see. I started to develop Mediumistic in some ways to find out if there was someone there with me. Fittingly, Lynch’s disruptions to the convent seem somehow the result of unseen forces such as those she experienced. Details of the convent itself accentuated, moved, out of place. Once noticed they not only lead to the audio but seem to open a space for it – to let it out. Correspondingly, Lacey’s works seem to emanate from the convent itself. Audible perhaps only as a result of Lynch’s work and shaped by the cracks from which they have emerged, but at the same time contributing somehow to their counterparts. The shuddering low tones of ‘You’re invisible to them, you’re beneath them’, for instance, seemingly aftershocks of some force that has already shaken the very foundations of the place. Lacey’s processing of the mediums’ voicings shapes them too as being of the space, stretched across time and contorted from their journey, at times repeating as if echoing down the halls. It was a matter of arranging the reading fragments into a workable order and then weaving the sounds in and out of those readings – to translate, through sonic affect, the emotional character of the mediums at different moments. These sonic dimensions to Mediumistic are particularly significant. Explaining her decision to use sound in the work, Lynch says she always thought ‘the hidden energies of the Abbotsford Convent’ that the work seeks to uncover ‘would manifest as sound and then translate to the audience as an experience that cannot be seen, but rather heard and felt’. It is the ephemeral qualities of sound, the sense that it is ‘not quite there’ in the same way as things that are seen, that made using sound such an obvious choice for Lynch and it is this approach to sound that underpins its role in the work. Sound is often treated as an ‘effect’ that is felt intuitively, along with its emotional and psychological resonances; a ripple that passes by as soon as it is sensed. As such, sounds, and particularly recorded voices, are in many ways associated with the other worldly, with ghosts, spectres, and the like. The famous ‘His Master’s Voice’ logo used to sell early gramophones, and recordings of many kinds since, was based on an artist’s impression of his dead brother’s dog’s response to hearing the voice of its deceased owner play from a phonographic recording. Horror films frequently feature the dead emerging from media technologies, not seen (clearly at least) but heard. It is even claimed that the voices of the dead can be recorded as ‘electronic voice phenomena’ or ‘EVP’. The dead, it seems, speak to us with recorded sound, the technology allowing their ghostly voices to be heard. Here, the ghost is me…so ghosts do exist…and I believe that modern developments in technology and telecommunication…the modern technology of images…like cinematography and telecommunication…enhances the power of ghosts and their ability to haunt us. His point, that the technologies that allow us to represent, to remember, those who have passed in so doing bring us face to face with our own passing. Lynch’s work demonstrates this, the mobile devices so many now carry serving as openings through which to hear voices of the dead and so sense our own ephemerality. Mediumistic helps visitors to the convent to look and listen beyond the seemingly obvious. Lynch says that making the work has left her ‘more aware of the subtle shifts of energy’, from ‘measurable qualities’ to ‘how certain pockets of space “feel”’ and walking around the convent exploring the work I found my attention drawn to the same subtleties. The role of sound and listening in the work is crucial to creating this effect, drawing out as it does a sense of the ephemeral. Moreover, the work shows participants how to embrace and explore that which haunts them, teaching us to listen to and learn from the voices of the spaces we inhabit in order to reappraise our sense of place. Mediumistic: experiential sound and sculpture walk, Kasia Lynch, 2014, work in situ: ‘A gateway’, gold-plated etched marble base, signage, sound composition. 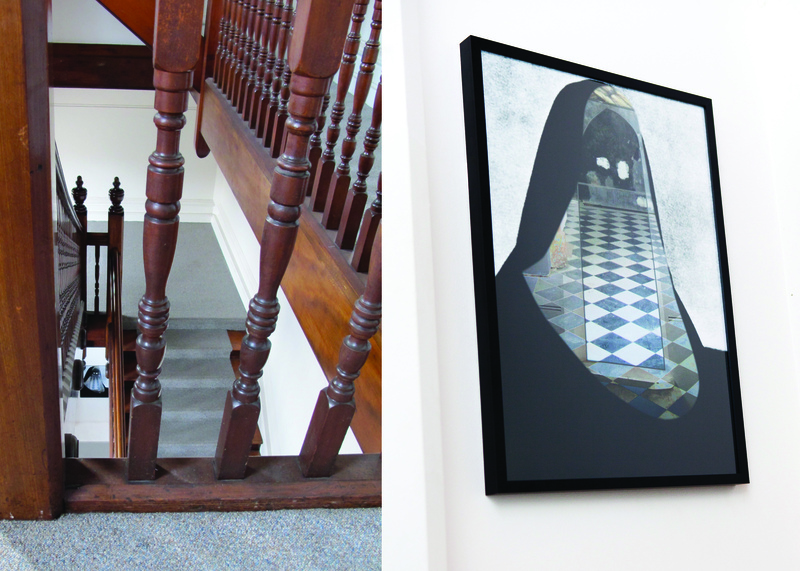 Mediumistic: experiential sound and sculpture walk, Kasia Lynch, 2014, work in situ: ‘Be very careful on the stairs’, photographic collage 50 x 70cm, signage, sound composition. 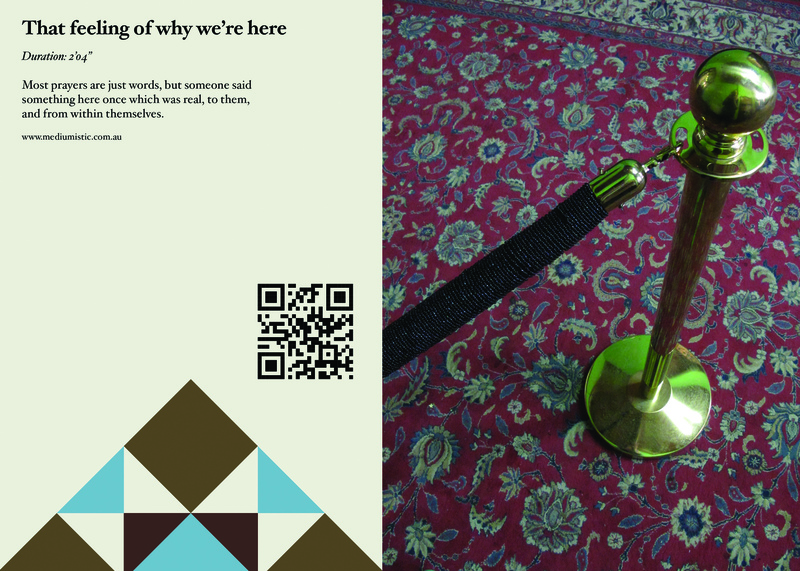 Mediumistic: experiential sound and sculpture walk, Kasia Lynch, 2014, work in situ: ‘That feeling of why we’re here’, brass bollard, glass beads, thread signage, sound composition.